The intuition sessions I conduct in mid-summer are so lush. Everything we love most about July comes through–spirits we’d never otherwise meet; a sweet, wild verdancy demanding that we love and be loved without limits. Today I had a client who was awash in really beautiful leonine energy. She was of female body but, as our culture is finally learning, this did not preclude her highly evolved masculinity. We did our work and by “we” I do not just mean me and this beautiful lion person but also my familiar, the tiny cat known as Grace. As this client left, a lion-spirit came through so clearly that I went online and found an image of him. 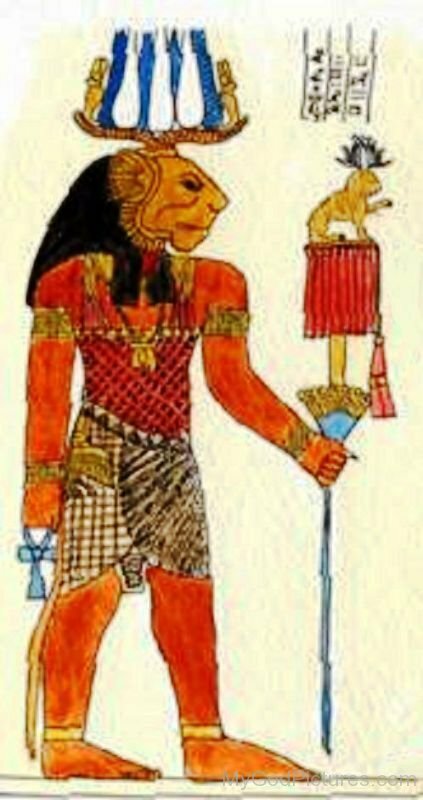 Meet Maahes, the Ancient Egyptian solar god who only fought in the name of social justice. One translation of his name is “True Before Her.” A gentle warrior who defers to the divine feminine? So grateful to meet him, especially as it seems he’s already befriended my permakitten. What is channeled in my office is never just for the people who enter it. Today it’s for everyone seeking a different model for male behavior. For Americans, in other words. Earthlings.